“Bloom where you are planted”—so goes the age-old saying. But Janice Maglasang, a self-proclaimed “Neverlander” as she has christened herself in her blog, wasn’t down with just staying put in one patch of land. 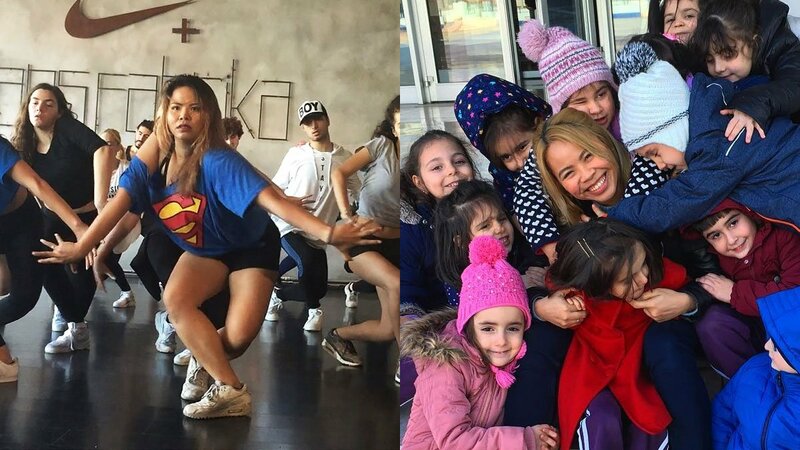 Instead, she uprooted herself three years ago in the name of personal growth and adventure and built a life for herself in Istanbul, Turkey, where she now splits her days as a full-time kindergarten teacher and a part-time dancer and dance instructor at a leading hip hop school. If you, like Janice, have set your sights on a life across the seas, read on for helpful tips on making it in Turkey, as well as all-around inspo on making any dream come true. What were you doing in the Philippines before you moved to Turkey? I was working as a creative strategist officer at an events/marketing/PR/creative agency. I was working with big companies and it was a really high-pressure job. A few months before I left for Turkey, I took over one of our family companies as director of a school that ranged from kindergarten to college level. How did the opportunity to work in Turkey come about? Two things made me fall in love with the idea of living and working in Europe. The first was my first solo trip around Europe in 2012, and the second was my internship in Bulgaria in 2013, where I taught dance, music, theater, and English to orphaned and abandoned children at an NGO. After those two experiences, I researched about the best way to move to Europe, and teaching English in Istanbul was the easiest way. Istanbul is the only city in the world that sits in two continents, Europe and Asia, so I went after that goal because it would bring me closer to other European countries. To be able to teach in Turkey, I had to get a TEFL (Teaching English as a Foreign Language) certification. The course is 120 hours and you have modules and sheets you need to finish successfully to get the certification. Without this certification, you can’t teach at a good school in Turkey and you can’t get a work permit. What challenges did you encounter as you moved to Turkey? How did you overcome these? The language barrier was the most difficult! English proficiency isn’t very good in Turkey and it was initially so difficult for me to find Turkish people who could speak English. Even most of the government officers in offices for foreigners can’t speak English. The residential paperwork was so difficult to process! The culture and mentality of the people took a while to truly understand as well. Even until now, some of their behaviors and mentalities still surprise me. Their work ethic is also different from what I was accustomed to. Sadly, things are a lot less efficient here. I also missed certain things I was accustomed to in my lifestyle back home that I couldn’t find in Turkey. I just learned to adjust to how things were here, learned the language more, and just made do with what I had access to. There are many bad things that have happened to me here, but I’ve always applied my positive thinking to any given situation. I’ve experienced stalking, harassment, and even worse things, but when I retell these stories to people now, I laugh about them. It’s just about not letting life bring you down to the point of being jaded. Describe your work as a kindergarten teacher in Turkey. What’s a typical workday like? My school’s curriculum is completely in English, and it’s my responsibility to teach the kids all the subjects: English, math, science, art, gymnastics, crafts, and life skills. I get a weekly plan and my Turkish co-teacher and I can make the daily schedule of lessons however way we want, as long as we finish the weekly syllabus. Every day, I do a variety of lessons, and in between, the kids and I do playtime in the park or playroom. I also have to eat with them and help them during mealtimes. Sometimes, we also do out-of-school trips. Every day is different, but what is constant is teaching; hugging, kissing, and showing a lot of affection to the kids; playing; comforting crying or fighting kids—it’s really a crazy, happy mess all the time. I was already passionate about teaching back in the Philippines, but teaching kids I grew to really love when I moved here. Tell us how you got into dancing and dance teaching part-time in Turkey. Dancing has always been a passion of mine, and I went to three different dance studios before I found the one I’m with now. The studio I dance with is Dans Fabrika; it’s considered the biggest and best hip hop school in Turkey—and we also have Nike as a partner. In April 2016, I attended the class of Omer Yesilbas, the winner of So You Think You Can Dance Turkey and the owner of the studio. He loved me in his class and he spoke to me and recruited me to his studio team after the class, and I’ve been with them ever since. We do performances and shows at different events, games, concerts, and in videos, and we even competed nationally and won gold. It’s strange to be a national champion for something in a country that’s not yours. I never really thought I could dance professionally in Turkey, but now, I’m also teaching in the studio as well. It’s one of the things that make my life in Turkey more enjoyable and fulfilling. I get to live my passion and I found a second family in my second home. How do you spend your days off? What do you do for leisure and fun? The studio usually takes up most of my time, including weeknights and weekends. But when I do find some time for myself, I hang out with my friends or travel somewhere in Europe. Most recently, I started MMA (mixed martial arts) training with a personal trainer. How much do you earn as a teacher and dancer/dance instructor in Turkey? Compared to what you were earning in the Philippines, is this higher or lower? The range for a full-time teacher is typically P55,000-P82,000. As a dancer/dance instructor, it depends on how many students are in my classes, how many private classes I have in a month, or if there are performances I am part of. But the minimum for that part-time work is like P20,500. What I get here is considerably higher compared to my salary in the Philippines for any of my jobs. For the daily living expenses, this is my typical breakdown: rent is P10,000 (I divide rent with three other people that’s why it’s cheaper), food is P9,500 (I’m always on the go so I end up eating out almost all of the time), transportation is P4,100, phone bill is P680, and gym membership is P1,900. These five things are constant every month; my other expenses vary every month. A huge chunk of my salary goes to my savings. It’s a top priority for me to set aside money for travel, occasional shopping, leisure, or emergency use. Do you see yourself working in Turkey for a long time? Due to my experiences, I’m a believer in adjusting to what life is giving you. I’m obsessed with planning; I can have my Plan A-Z, and yet sometimes, things won’t always go the way I want because life happens. I was originally supposed to be in Turkey just for one year, but because of the unique opportunities I got here, and the people that I got to meet and build relationships with, I kept extending my stay. At the moment, life in Turkey is giving me many different facets for building myself as a person, so I am staying put. If things change, I can always go to the next adventure elsewhere, or settle down handling the family business at home. What lessons have you learned about yourself and about the world after having survived all these years living away from the Philippines? When you live abroad, you learn the best and the worst of who you are. You learn to be stronger as it forces you to push your boundaries, and it helps you develop this trust in yourself that no matter what, you can take care of yourself and find solutions to any problem. You also learn to accept being weak, and learn to accept help and open up to other people that you’ve only known for a short while. I’ve always been strong as an individual, but it took moving abroad to help me learn how to accept being vulnerable. I’ve been travelling solo for six years now, and the world never runs out of things for me to love, appreciate, and be amused by—both positive and negative. With my collective experience, I find that the world is neither all bad nor all good; it’s just your mindset and how you view the world that shapes how it is for you. What advice do you have for Pinays who want to try working in a foreign country? Right before I left for Turkey, there were so many things that tempted me to stay in the Philippines instead. But when I really thought hard about it, my fear of leaving was never greater than my want for something bigger than myself. It’s really scary to uproot yourself from your comfort zone and try to survive and thrive in a foreign country, but when you do, it’ll no doubt be one of the best achievements of your life, and one of the best things you can do to improve and better yourself. Before leaving Manila, I opened up to a good friend about my fears. He said, “What are you worried about? You can always go home.” And this is what gave me the strength to go for it one hundred percent. ‘Cause at the end of the day, whether or not things work out, you can always find your way back home—but as a better, stronger you.